Thank goodness for 2010 San Diego Comic-Con! We’re getting SO much news on our favorite shows, like The Vampire Diaries. We’ve got some season two werewolf goodies thanks to an interview with Matt Davis (Alaric), Paul Wesley (Stefan) and Michael Trevino (Tyler). At Comic-Con last weekend, the guys were asked what they think their Michael Trevino, the werewolf on the show, will look like as a wolf. Their answers weren’t exactly serious, but they were funny. “He’s going to look like ‘Teen Wolf,’ like Michael J. Fox. You ever see that? 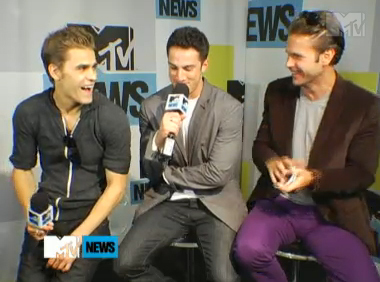 He’s going to be on the basketball team,” Paul said jokingly. “His eyes are going to get big and he’s going to spring a couple of chest hairs [insert bing bing noise here],” Matt said. “Yeah, and, like, two little floppy ears,” Paul added. Michael wasn’t too happy with his castmates’ teasing. “Let’s just all gang up on Trevino here,” he grumbled. Michael and creator Kevin Williamson then confirmed that Tyler will complete a full transformation during a full moon, but it won’t happen until episode 8 or 9. “I’m not really sure yet where he will actually go through the transformation, but a lot leads up to that. It’s a very multi-layered curse,” Kevin hinted. The Vampire Diaries will return September 9.